Today I had the distinct privilege of leading an activity in my son’s class. Every parent has to do so at some point, so I took my fear of sticky little people who are not my own and put it aside to join them in doing something fun that would be “in my wheelhouse.” I knew right away that I would do something involving quilting, but I wanted to do something that would involve them. Seeing the similarities between quilting and collage, I went the obvious route but instead of opting for paper pieces for them to play with, I gathered up leftover bits from old projects/quilts that I had stored hoping to maybe use for something else in the future – tons of 2 1/2 inch squares, leftover drunken path blocks and triangles, step-through pieces from past classes, all that jazz. 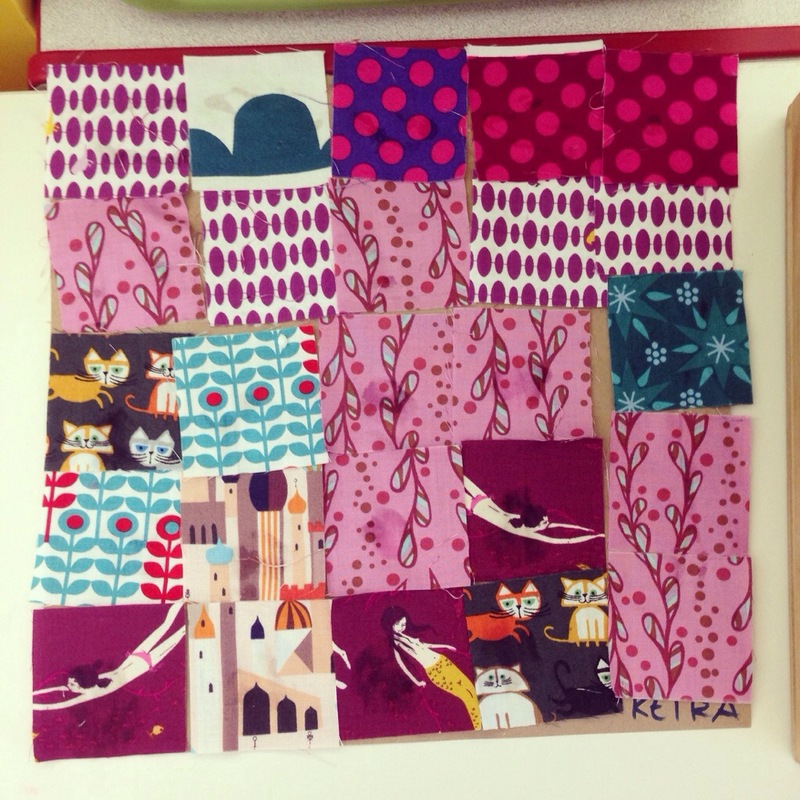 Originally, my plan was to divide them into groups of 4 and have them work together on 24 inch squares of craft paper. Then I remembered we’re dealing with 4 year olds and it would probably work best if they each had their own block. And it did indeed work fabulously! The kids were broken up into their regular 3 tables and were each given a 12 inch square of craft paper. I went around and distributed the scraps as evenly as I could between the 3 groups. The kids were totally into the colors and prints. They were so excited by the mermaids and wizards and hedgehogs and spiders, oh my! 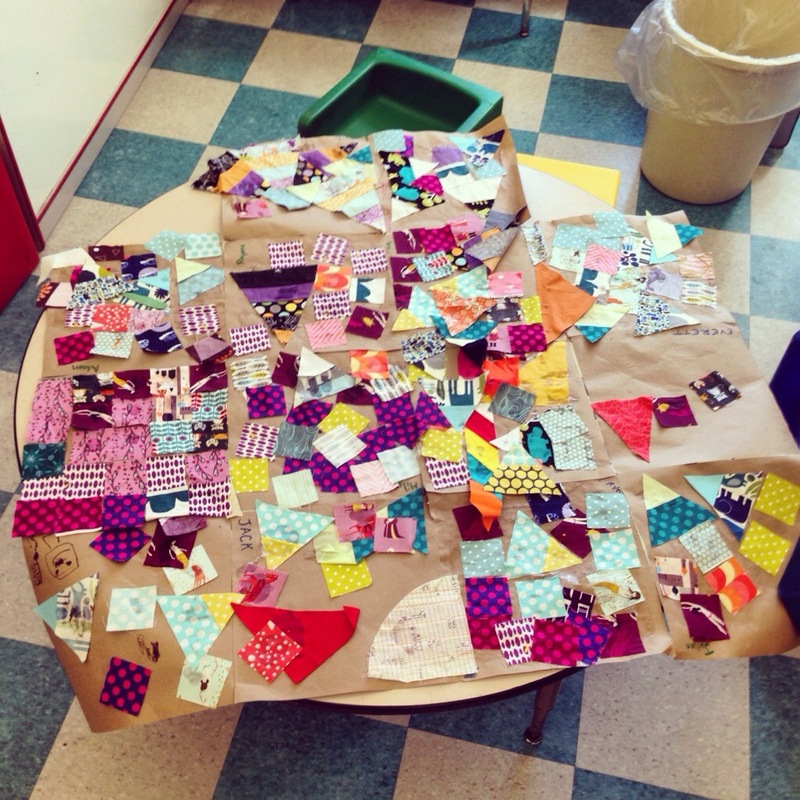 They grabbed a bunch of scraps from the heaps at the center of their tables and glued them down onto their squares. It was interesting to see how some kids really planned their layouts while others just started gluing pieces down as they grabbed ’em. They all did such a great job! After a snack while we waited for the squares to dry, we all gathered around to assemble the blocks into a “quilt top.” As we taped the blocks together, I had sections of kids tape sections of the quilt. It was so awesome to see how they were all so eager to participate. Everyone got at least one piece of tape on the back of the “quilt.” We talked about “many hands” and community, how all their individual blocks came together to form this whole piece, how they each put a little bit of themselves into this thing that represents them all, how they can still see their individual blocks but the blocks now play together as one whole piece as they play together as one group. It was pretty cool to see how they actually seemed to get it and appreciate it. Or at least, I think they got it. At the very worst, they would walk away thinking they had made some neat thing.